First blood – in the money! Wow last 48 hours have been most turbulent to us. Let me start with the most recent and best news: Katja made the money in the $1500 7card-stud event and continues playing today! Most remarkably she made it through a star studded field where about every brand player was participating (except those in the $5000 day2 like Luske, Hellmuth, Mercier, Bellande). The event draw 478 players, including Katja and me. I decided to join only 10 minutes before the event actually started when Katja already left ( I had slept over) and rushed over just in time to buy me in and get the first hand. Hand #2: I have KT-K and raise, bracelet guy re-raises showing a T. I make it 3 bets and he calls. Next card I get a T for two pair! He gets a deuce. I bet, he calls. 5th street brings me a blank and he gets a 4. I bet, he calls, fast. 6th street he gets another 4 and calls my bet again. On the river I catch a 4 and think to myself “puhhhh…” and bet – only to get raised! I simply call and he shows his hole cards: K47 for trip fours! Outch. I had about no chips remaing and went out short before the second break with a pair of sevens. Then the long sweating begun. Katja was short on chips also (less than 1000) on the second break and I decided to watch her as close as possible. Little did I know that it would take 10 more levels (!) until the final 40 players were left so about 15 hours includingf all breaks. I mean, railbirding her for that long time restisting all urges to get into action myself is about the biggest love-proof that I have. But it was really thrilling. Katja had such a hard table that is was a pure pleasure to see that and her surviving. 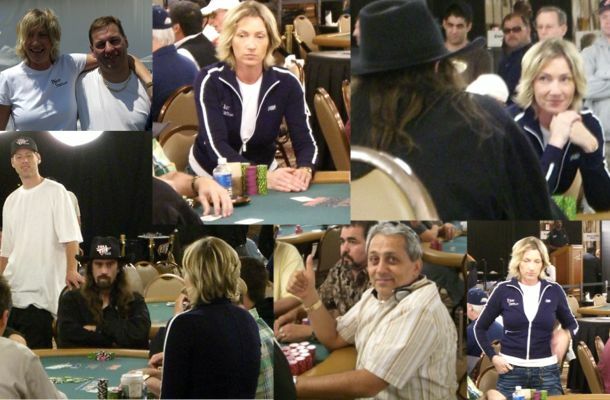 She played with Chris “Jesus” Fergusen from the beginning for about 12 hours (she had him all-in when he catched a gutshort straight vs. her two pair and he had her all-in with trip aces when she had a boat in five cards). Besides this, her table saw a real lot of stud specialist of good-alrounders. John “World” Hennigan, Rafael Perry, Perry Friedman, Sam Grizzle and two more stud specialist whose names I don’t know exactly. Anyway, Katja did it and I am very proud of the way the played there: selective but then ultra-aggressive, at the same time she had no problem folding a hand she just had 3-betted when her opponent has visible improved. The day before Katja played the $5000 NL event.She got very far in that one also. Again she had a difficult table (there was no easy table that I saw). Direct behind her were Greg “Fossilman” Raymer and Steve Dannenmann. Katja played well, had a nice stack of about 11000 at one. As Steve Dannenmann told me Katja had owned Men “The Master” totally, first bluffing him out of a big pot and then having him call all-in when she had the nuts :). But then Katja got card-dead for hours. She finally moved all-in on the button in Level 8 when she had only about 6000 chips left when she found TT. Raymer called in the BB, holding JJ, ending her tournament. I flop two pair with my AKs on a AK2 flop against a raiser. Tight guy. We get into raising war on the flop, two bets on the turn and river check-check, he has 22. QQ, I raise in UTG+1, it’s gts raised behind me, all fold, I four-bet. Flop comes 8 high, unsuited. I bet, get a raise and make it 3 bets to go. He calls. Turn is a J, I bet, he calls. River K, I check as think AK is most likely and yes, he bets, I call. Guy shows me KJo. AQ of hearts, I raise UTG, MP player calls. Flop comes AT3 with one heart. I bet, get raised and three bet right away, not going for the check-raise on the turn. Turn comes J of hearts giving me top pair and nut flush draw. I bet, get raised and three bet it. He only calls. River if a black four, I bet, get raised and call only. That guy shows KQo for the gutshot straight on the turn. AA in the BB. Two limpers, one raiser, I make it three bets. All call. Flop comes QJ8 with two diamonds. I bet, it gets raised, one caller, one folder, I make it three bets. Two call. Turn is 2 of clubs, good card for me, I bet, one guy calls, one folds, it’s head-up now. River T. I bet, get raised and make the donkey call to look at 89o. My SB, QT. It’s get’s raised by the same guy that just beated me two times and I call, head-up. Flop 89T of spades, I have the Q of spades. I check-raise-call him on the flop with my top-pair+straight/flush draw. Turn is red J, giving me the straight. I bet, get raised, re-pop it and he calls. Turn is another 2, but spades. I made the Q high flush and bet out, get raised and call, already knowing what’s coming. He shows A8o, A of spades for the better flush. I grab my chips and leave the poker room, disgusted. Sorry, there would be so much more to talk about but I am short on time now.